Provides data to evaluate whether water quality criteria are being met: The Narragansett Bay monitoring systems generate a primary source of data for the RI Department of Environmental Management (RIDEM) to evaluate water quality against state criteria for dissolved oxygen and provide critical data for the state assessment of water quality impairments in upper and mid-Narragansett Bay. Improves understanding of water quality trends and relationships: Dissolved oxygen monitoring in the bay provides high-resolution temporal and spatial water quality data, gives early warning of hypoxic events, informs the development of predictive water quality models applicable to future management decisions, and generates data to improve understanding of nutrient pollution and hypoxia. 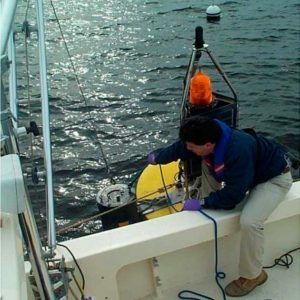 Indicates efficacy of infrastructure improvements: Monitoring dissolved oxygen levels in the bay helps determine if infrastructure improvements implemented by the Narragansett Bay Commission and other wastewater treatment facilities to reduce nutrient pollution are working as designed. In Narragansett Bay, a critical component of water quality is the amount of dissolved oxygen (DO) in the water. DO, which is just like oxygen in the air except dissolved in water, is essential to marine life. Fish and other aquatic organisms such as lobsters and oysters need oxygen to live, just as humans rely on oxygen in the air; Rhode Island relies on these abundant resources for a healthy economy, including commercial and recreational fisheries. DO levels naturally vary based on conditions such as water flow and temperature (fast flowing and cold waters tend to have more DO than slow moving and warm waters), but can also be affected by human behavior such as excess nutrients that are released into the bay from wastewater treatment facilities and runoff from overly-fertilized lawns. Hypoxic events are influenced by a number of factors, and the consequences vary, based on the circumstances. Image courtesy of U.S. Environmental Protection Agency. Hypoxia occurs when DO levels drop below 2 milligrams of oxygen per liter of water (mg/L). A more extreme version is anoxia, when there is no oxygen in the water (often defined as less than 0.5 mg/L of dissolved oxygen). Hypoxic events can occur over small or large spatial areas, and can be temporary, lasting a few hours to days or even months in the case of seasonal events such as in Chesapeake Bay or the Gulf of Mexico. When a hypoxic event occurs, animals that live in that area need to either be able to survive low oxygen or flee the area. In some cases, the fish cannot escape these low oxygen conditions and the hypoxic events causes a fish kill. Fish kills can range in magnitude from a couple dozen dead fish floating on the surface of the bay to hundreds of dead fish washed up on shore. Rhode Islanders saw firsthand the impacts of hypoxia during the 2003 Greenwich Bay fish kill. 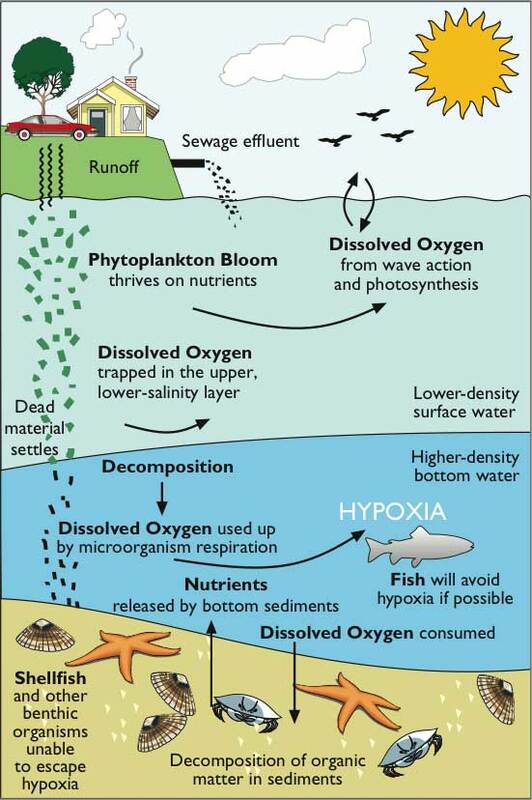 Hypoxia is caused by a series of biological interactions that deplete the water of oxygen. It starts with a sudden growth of microscopic algae called phytoplankton, referred to as an algal or phytoplankton bloom. These blooms occur when there are high levels of nitrogen in the water. Nitrogen is naturally occurring and important to support phytoplankton, which is the basis of the food web, but nutrient pollution from human activity—such as runoff from fertilized land or discharges from wastewater treatment facilities—results in too much nitrogen in the water and leads to algal blooms. Then, when these short-lived algae die, bacteria break down the plant matter through decomposition and use oxygen in the water for this process. So, when all of this is put together, excess nitrogen leads to algal blooms that, when they die, need an abundance of bacteria to decompose, which rapidly depletes DO in the water. 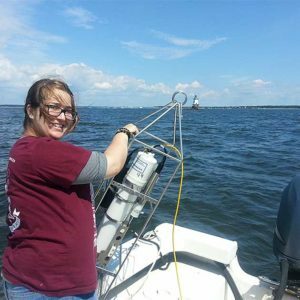 There are two principal efforts to monitor water quality­—including DO—in Narragansett Bay: the Narragansett Bay Fixed Site Monitoring Network and Brown University-led field surveys. The Narragansett Bay Fixed Site Monitoring Network (NBFSMN) is comprised of 13 total locations (8 buoy sites and 5 fixed dock sites) where sensors perform real-time monitoring of water quality in the bay. The sensors measure many different aspects of water quality, including chlorophyll, fluorescence, pH, temperature, turbidity, and DO. The field surveys, which are conducted from a boat, cover more spatial area than the NBFSMN, but occur only 3-7 times a year, usually in the summer months and targeting neap tides (lowest high tides and highest low tides) when hypoxic conditions are most likely to occur. Narragansett Bay Commission works on a buoy in the Fixed Site Network. Photo courtesy of NBC. Sampling water as part of the boat surveys. Photo courtesy of Brown University.